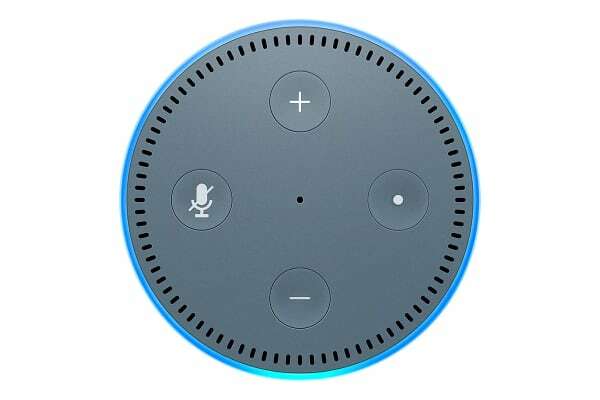 The Amazon Echo Dot is a hands-free, voice-controlled device with a small built-in speaker; it can also connect to your speakers/headphones over Bluetooth or through a 3.5mm audio cable to deliver stereo sound to speakers. The Amazon Echo Dot can hear you from across the room, even while music is playing. When you want to use Echo Dot, just say the wake word “Alexa” and Dot responds instantly. If you have more than one Echo Dot, Alexa responds intelligently from the Echo you’re closest to with ESP (Echo Spatial Perception). Sleek and compact design makes Echo Dot a convenient addition to any room in the house. With its built-in speaker, you can place Dot in the bedroom and use it as a smart alarm clock that can also turn off your lights. Tucked under the light ring is an array of seven microphones that use beam-forming technology and enhanced noise cancellation. 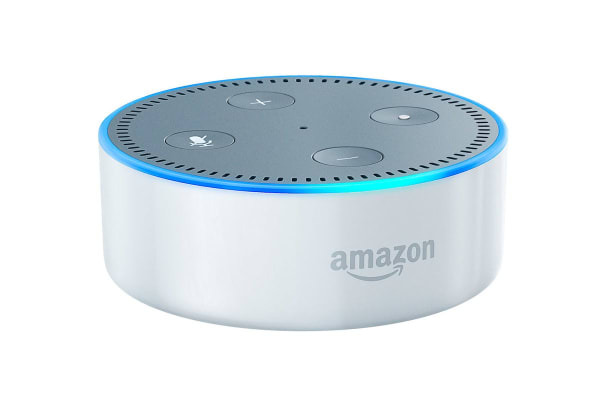 With a more powerful processor, the Echo Dot has improved wake-word performance to hear you ask a question from any direction even in noisy environments or while playing music. Control multiple devices such as lights, switches, TVs, fans, etc., at scheduled times or with a single voice command. Echo Dot can also directly connect to speakers using a 3.5mm stereo cable, Bluetooth or Wi-Fi for compatible wireless speakers to add voice control to your home stereo system in the living room. With multi-room music support and connected speakers via cable, you can play music across multiple Echo devices (Bluetooth not supported for multi-room music). With the Drop In feature enabled for room-to-room calling, instantly connect with compatible Echo devices in your home. Echo Dot provides hands-free voice control for Amazon Music—just ask for your favorite artist or song, or request a specific genre or mood. You can also search for music by lyrics, when a song or album was released, or let Alexa pick the music for you. Set a music alarm to wake up to your favorite song or playlist. Skills add even more capabilities like ordering a pizza from Domino’s, requesting a ride from Uber, tracking your fitness with Fitbit, ordering flowers from 1-800-Flowers, controlling your TV with DISH Hopper, and more. Enabling skills lets your Echo Dot do even more – simply discover skills you want to use in the Alexa App. To enable a new skill, just ask Alexa.